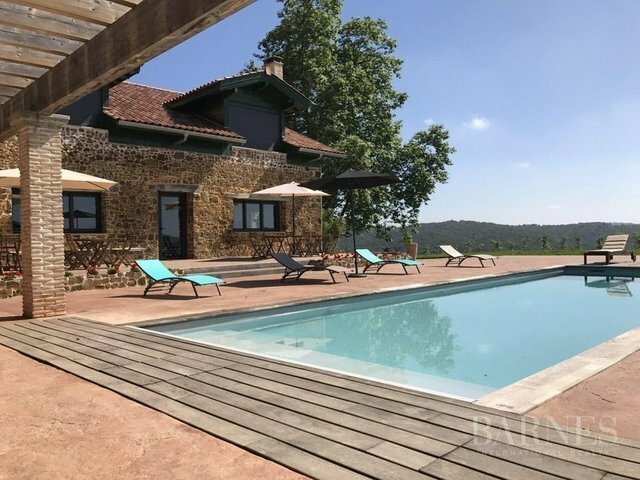 Very beautiful restoration for this character Basque farm house of approximately 400m² of living space using very good quality materials in a unique enviroment only 30 minutes drive from Biarritz. 6 bedrooms and 6 shower rooms,lift, 2 immense living rooms with bidache stone on the floor and fireplace. Authentic bar, relaxing room with jacuzzi and hammam, sport fitness room, barbecue area, swimming-pool( 12X4) and ideal for upmarket bed & breakfast in total peace and tranquility. Land 1.5 acres with a possibility to acquire a further 40 acres.